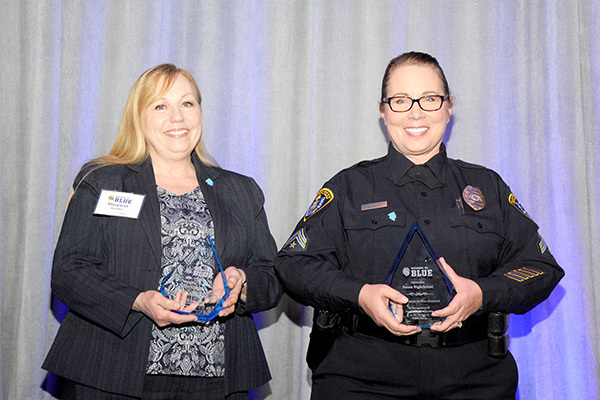 The San Diego Police Foundation’s 9th Annual Women in Blue Luncheon attracted more than 450 attendees, making it a grand celebration of the women who protect and serve San Diego. The Faces of Courage gallery greeted guests outside the Hilton San Diego Bayfront’s Indigo Ballroom. 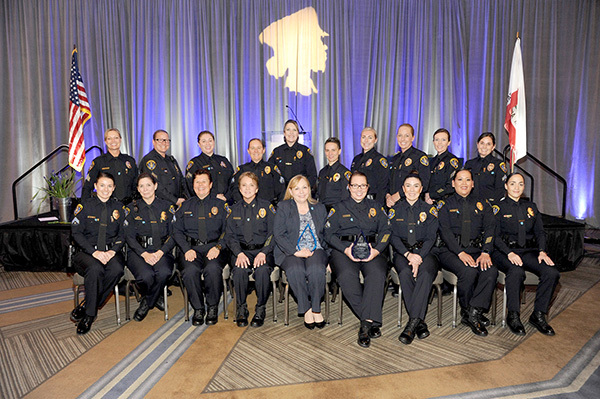 The accomplishments of the 2019 honorees, Detective Susan Righthouse and Margaret Mendez, exemplified this year’s theme, “Courage Knows No Gender.” This year’s honorees include one sworn officer and one civilian professional, illustrating the complementary ways in which uniformed personnel and their civilian counterparts work together to protect San Diego. Righthouse is a 29-year veteran of the San Diego Police Department. Involved in every type of criminal investigation at the local, state and federal level, including child abuse, domestic violence, gangs and narcotics cases, for the last 13 years, she has been assigned to the Internet Crimes Against Children (ICAC) Task Force. Righthouse investigated more than 400 child abuse-related cases and is responsible for more than 250 child predator convictions. She is the recipient of the Exceptional Performance Citation and Commanding Officer’s Citation for her work on the ICAC Task Force. Mendez is the human resources manager for the San Diego Police Department, serving as the commanding officer for the Human Resources Division. She has 16 years of police-related experience assisting supervisors and managers in navigating personnel-related laws, policies and procedures. Mendez serves as an instructor on personnel issues for the San Diego Regional Training Center, POST Management Course and was previously honored with a City of San Diego Diversity Distinction Award. Dozens of uniformed officers also joined the festivities to meet and greet guests, underscoring the importance of strong ties between law enforcement personnel and the communities they serve. Net proceeds of just over $149,000 were raised to propel the mission of the San Diego Police Foundation: to ensure that those who protect and serve San Diego have what they need to do their jobs safely and with excellence. The safety of men and women in blue –– who often run towards danger to keep San Diegans safe –– was a high priority for donors that day. The money raised will fund equipment and training, such as rifle fire-resistant plate carrier vests for officers, the San Diego Police Department’s quarterly Women’s Leadership Conference, and much more. — The San Diego Police Foundation is dedicated to preventing crime, saving lives and making our community a safer place to live and work by providing resources not otherwise available to the San Diego Police Department. The foundation funds equipment, training and outreach programs that are vital to creating a safer San Diego, strengthening community/police relations, and raising awareness of the extraordinary contributions of law enforcement officers. The San Diego Police Foundation is a nonprofit 501(c)3 organization that is supported entirely by grant funds, organizations, corporate sponsors and individual donors. To learn more or make a donation, please visit sdpolicefoundation.org.